..Chivalry Sports, a Renaissance-themed clothing and gear store, is closing its physical location… and will operate online only. "We'll be working for nothing for a while," Gael Stirler said. "We lost $25,000 in March. That's more than some people make in a year. We've had to pour our own savings into the company just to keep it going." Hope abounds with the online-only format, because Stirler estimates that more than 80 percent of the store's sales took place at the store's Web site, www.renstore.com She said Chivalry needed a physical presence primarily as a place to store the merchandise for shipping all around the country, as well to house the computers she needed to support the self-hosted site. Stirler said the company spent at least $6,500 a month on salaries, maintenance and software support just to be able to sell online. Chivalry had 30 employees before 2001, when it gradually scaled down to eight employees by the beginning of 2008 due to decreased sales. Now the company consists of five employees, including the owners, and will include just one paid part-timer for a monthlong transition period. "We have to kind of assume the worst," she said. "That it won't work and we'll have to go out and get jobs." Last year a friend asked her to help at a performance by painting children's faces. Connors, who already had costumes for a character she calls Pixie the Prankster, obliged. Last winter, she played Sprout the Storyteller at an Arizona Renaissance festival. Face-painting skills were further honed at street festivals during her roundabout trip home. The first request she ever received was to paint a poodle, and she's had some challenges at Summerfest as well. One girl asked her to replicate a photo of Miley Cyrus. A boy asked her to paint Godzilla on one arm with lasers pointing to the other arm, where she was directed to paint Mothra. Elgin artist and former "playtron" Juli McCarthy will be offering handmade polymer jewelry from her Mockingbird Studio for the first time this year at the Bristol Renaissance Faire in Kenosha, Wis. 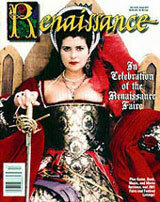 The faire opens July 11 and runs weekends through Sept 7. "Playtrons are patrons who play along. They pay admission like regular patrons, but they come to the faire regularly, dress to fit in, and get more involved in the goings-on at the faire. They are frequently very knowledgeable about the historical aspects of the faire, and play them out. The faire is immersion theatre. As soon as you come in the gates, you are part of the show. And now we have a live action role-playing game, called RenQuest, that allows patrons to take an even bigger role in the proceedings," McCarthy said. 1. Could you explain the outfit that you will be wearing at Bristol? Elizabethans were extremely class-conscious, and the clothing that participants wear reflects their social status. Merchants are members of the middle class and dress accordingly. Standard garb for women is a shift called a chemise, a bodice (sometimes incorrectly called a corset), and layers of skirts, with the nicest, newest skirt being worn as the top layer. And a hat, of course. No self-respecting woman would show her bare head out in public…. Step over the scraps of felt, leather and fur and you'll find Chip Lorimer's leather-crafting lair. Wearing a thick apron and with his long hair tied back, Lorimer, 47, swabbed stain onto a pirate belt. The craftsman said his hobby became his business about seven years ago, selling handmade specialty leather items online and at renaissance fairs. Some items are based on authentic designs, while others are just for fun. He will be at the Silver Leaf Renaissance Faire this year at Kimball Pines Park in Emmett Township. Did women historically have push-up bras in their armor? "Generally, you didn't have too many warrior princesses anyway. And what kind of armor is this with the belly open? I mean, this was heavily inspired by a Xena outfit on the TV show..."
How much is done by hand? "There's a lot of leather crafters out there that use every modern convenience they can, and I kind of embrace the old-world style of doing it. Each one of these little holes I punched by hand. Tap, tap, tap, tap. And I cut this out by hand. I edged it by hand. I do everything by hand. That's one of my selling features..."
How did you get into renaissance fair leather crafting? "(I saw) a lot of people out there wearing their big leather armor and things like this that they'll drop a shiny penny for, and ladies wearing their bodices, all kinds of things. Pouches and belts and bags and mugs and things like that, but I noticed a big lack of stuff for the women. And I thought, 'Well, I wonder if I can make something.'" What do you like about the fairs? "Lot of ways to play dress-up and make believe, to some degree, that you just don't get to do in real life. ... I just feel a lot of kindred spirits there." You said you have a fair persona. "I have actually two, which is kind of rare. Most people seem to have, like, seven or 10, which drives me batty because sometimes you can't, 'Which one are you today?' My most prominent character right now, which is actually sought out on occasion, I guess, so I'm told anyway, is the Pirate Black Roger." "A fine lad he be. ... He's commonly described as the lovable drunken scoundrel. ... He's actually one of the pirate lords of the Great Lakes…"
Ravenworks, a small, web-based company specializing in one-of-a-kind cloaks, capes and ruanas, is opening its first brick and mortar store at West Gate Mall in Madison, WI. The store will carry not only dress and outdoor capes and cloaks, but will also be carrying a line of Medieval and Renaissance clothing items for adults and children, as well as divination tools, jewelry, statuary, books and CDs. "It's been wonderful to have a chance to meet our customers face-to-face," said Raven Albrecht, owner of Ravenworks, "our customers are such extraordinary people, and I love having the chance to find them that one special item that will meet their needs." The new store, along with the usual Ravenworks faire, will have some delightful surprises in store. Raven has managed to find a special line of magical stuffed animals, mysting fountains, and even gorgeous "real magic wands" from artist Abbey Willowroot. Ravenworks will continue to maintain its popular web-based business www.Ravenworksip.com, but will also be serving customers at the new store Tuesdays through Sundays. For more information, contact Raven at 608-630-2348. The Boys & Girls Club of Souhegan Valley seeks vendors, entertainers and crafters for its fifth annual Renaissance Faire, which will be held from 10 a.m.-4 p.m. Saturday, Sept. 8. Crafters who work in medium appropriate for the time period such as weavers, glassmiths, metalsmiths, woodworkers and potters are sought. The day will include games, food and entertainment on the grounds of the Boys & Girls Club of Souhegan Valley Club, 56 Mont Vernon St., Milford. KINGSTON — Enter 319 Wall St. in Kingston, where you'll find Jay Reeder madly sewing away in a back room. He has been making Renaissance clothing since 1996 and owns a Renaissance boutique called Knightly Endeavors. Spring, summer and early fall are his busiest times of year…. Suzanne Buffalino, owner of Grand Companies in South River, N.J., said she began her career selling Renaissance clothing because she loved to sew and she loved attending fairs. She started sewing out of her home, and eventually decided to go into the wholesale business. Today, she sells supplies to 75 Renaissance clothing makers all over the world, including New Zealand and Australia, and she buys dresses from manufacturers to sell in her store and online. Buffalino said she couldn't continue to do customized orders, which were time-consuming, and maintain a retail location, so she chose a wholesale business. He's not sure if he would recommend this kind of work. "My head says no and my heart says yes," he said. To see the complete, much more detailed article, please go here.